I didn’t bring too much here to Germany… enough to fill one suitcase, one backpack, and a little extra. There are some things, though, that I just had to bring. Pictures of friends: If you’ve ever been in my dorm room in Austin, this probably doesn’t surprise you. My favorite people’s faces make my room a little less depressing. After I put them all up in what I thought was a clever and fun design, I realized that it looked a little like an angry cat face, and so I also put up some prayer cards. Now the wall is full of my best friends on earth AND in heaven! Sweet! And also it doesn’t look like an angry cat face. My UBI rock: This is one of two UBI rocks I got from my two summers at Covecrest, a Life Teen summer camp in Tiger, Georgia and a place that is very close to my heart. The inscription, UBI, stands for “U are the best, B Happy, I love you.” Two special people I associate this rock with are my BFF Laura, who also went to Covecrest the second year I went (which is when we became BFFs), and my friend Andrea, because I gave her my second UBI rock when I was her angel for Longhorn Awakening 48. It can also be used as a paperweight so, you know… score! Verses auf Leben und Tod: This is kind of cheating because I bought it once I got here, but it turns out that it’s pretty hard to find German novels in America. This one’s pretty good so far. It was originally written in Hebrew and then translated to German, and it’s about the life and experiences of an author. My goal is to finish it by the time classes start… we’ll see. My Cubs blanket: When I was packing, I wasn’t certain that they would have a blanket here for me. (In retrospect, that was kind of a dumb thing for me to worry about.) But I sure am glad I brought my Cubbies blanket with me! I got it for Christmas from my Aunt Pam a few years ago. You know how some blankets are soft at first and then they pill and get less soft? That never happened with this one because it’s magical. Also, I hope it will help me feel connected to the baseball season this year even though I’m not able to follow my boys this year. 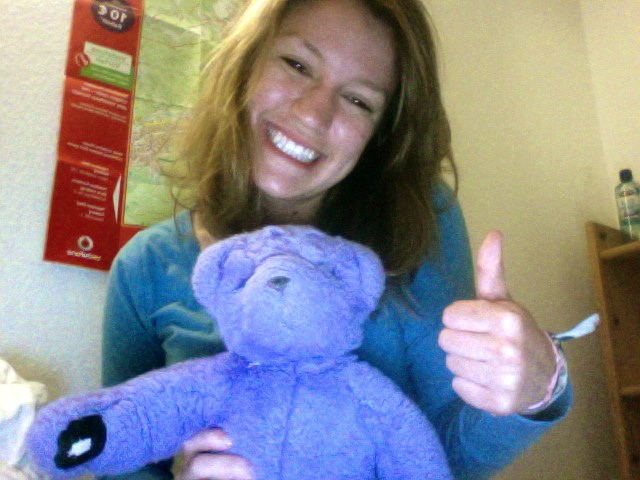 Purple Teddy: Since he turned 18 recently, I decided that it was time for Purple Teddy to see the world. Besides, he would have been pretty upset with me if I’d left him at home to hang out with my cats while I was in Europe. I actually brought him with me instead of bringing my traveler’s pillow. Totally worth it.